Bevel Seat Gasket Supplier in USA - SSP Manufacturing, Inc.
Bevel seat gaskets are one of the popular types of sanitary gaskets that are manufactured to withstand disassembly, reassembly, and COP (clean-out-of-place) in food and beverage process lines. These gaskets ensure positive shut off at high pressures. SSP Manufacturing, Inc. provides a vast range of these sanitary gaskets for industries where sanitation is a priority. 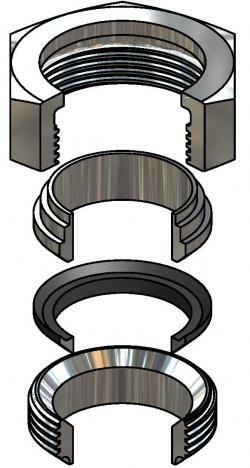 The specification table gives you information on bevel seat gaskets, and their dimensions. This information will help you make the appropriate selection. Buna N: This is a very flexible material, and is well-known for its compression qualities. Buna N bevel seat gaskets are widely used in food and beverage processing industries because this material can resist oils, hydrocarbons, fats, chemicals, etc. These gaskets are not recommended for ketones, ozone, aldehydes, nitro and chlorinated hydrocarbons. This is not an ADI free material. EPDM: This material offers good chemical resistance, and is economical choice for various acetone, ketone, and water based applications. The EPDM gaskets meet – USDA, FDA Title 21 CFR 177. 2600, and 3A specifications. FKM/Viton: This material is well-known for its chemical resistance to many alkalis and acids. These gaskets are not ideal for sterilization. 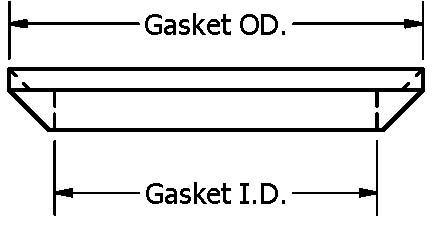 The Viton gaskets meet USDA, 3A, CGMP, and FDA Title 21 CFR 177.2600 specifications. 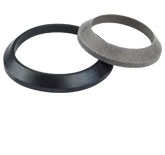 PTFE: These gaskets are ideal for applications where low temperature flexibility is required. The PTFE gaskets have low absorption rate. They can strongly resist process fluids, and can be used for water and steam applications. If used continuously, high pressure clamps need to be used. Our PTFE gaskets meet USDA, 3A, CGMP, and FDA Title 21 CFR 177.2600 specifications. PTFE material is Animal Derived Ingredient (ADI) free compound. Silicone: Gaskets made from silicone material can easily withstand temperature extremes, moisture and steam, corona, and ozone exposure. Silicone gaskets offer better temperature flexibility than PTFE gaskets. SSP Manufacturing is committed to provide high quality products at shortest turnaround times. For any queries regarding our bevel seat gaskets or other sanitary gaskets, please contact us on our toll-free number 888-238-SEAL or mail us at rrom@sspseals.com.